It was inevitable. After a number of shark attacks in Australia this year, it was only a matter of time before the words “shark cull” were bandied about once more. I just couldn’t have imagined that spearheading this hackneyed clarion call for revenge would be an article so devoid of reason that words can’t adequately express its ignorance. The Daily Telegraph this week published a compellingly absurd opinion piece calling on the government to endorse the killing of sharks. The article suggests that “great whites should no longer be a protective species” and that “the ocean is our domain and sharks have no place destroying lives and livelihoods”. I find it amusing the journalist pays homage to the “revered Mick Fanning” in her piece, yet fails to mention that it is he who specifically stated “we’re in their domain”. Perhaps she reveres him no more? She goes on to caution that if we don’t find a “permanent solution” to these “human cullers” soon, we’ll no longer “have to worry about sharks because there’ll be no one living on the coast. The shark will have won”. Wow. Hard to argue with sound reasoning of that calibre. As much as I sympathise with those who have lost loved ones in this manner, I never really have understood the quest for retribution that ensues in the wake of a shark attack. In the event of a fatality, the authorities promptly issue a “catch and kill” order for the killer, initiating a pursuit of vengeance (for one cannot reasonably call it justice) that simply astounds me. The offender is not some deranged human, bereft of empathy, who needs to be brought to justice. It is an animal, searching for food in it natural habitat, as it has done for some 400 million years. An animal that occasionally mistakes humans for its usual diet of fatty marine mammals. This is clearly why most shark attacks aren’t fatal and of those that are, the victim often makes it back to shore alive, well before bleeding out. Were a large shark wholly committed to the consumption of humans, I’m guessing there would be little in the way of remains left to identify. But even this fails to address the issue at hand. After any shark fatality, authorities are steadfast in their hunt for “the killer”. I’m curious as to how the killer is precisely identified. Do authorities round up a bunch of sharks for questioning, determining whose alibi holds up the least? 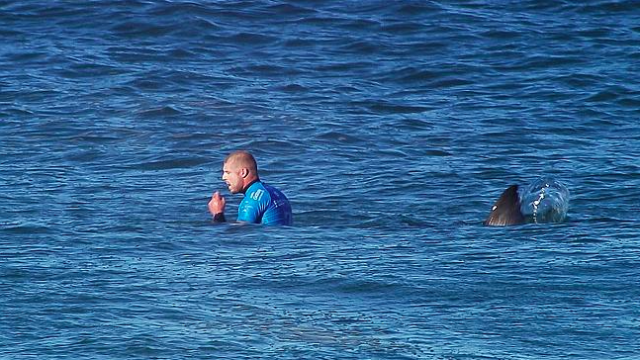 Is there an interrogation process that aids in ascertaining which shark was in the vicinity at the time in question? It’s preposterous to think that there’s any guarantee that the shark caught is the culpable one. But I guess that’s the point. Even if it isn’t, who cares? It’s just a fish, right? Perhaps the bloodied carcass of any shark hauled back to shore is enough to quench our thirst for revenge. Number 1: Reform of the offender. Needless to say, the shark’s subsequent destruction at the hands of humans is unlikely to see much reform in its behaviour. Well, I guess it won’t reoffend at least. So maybe that’s it? If we “catch and kill” the shark responsible, we might just dissuade all those other pesky sharks from engaging in similar acts of impropriety in the future. Doubtful. Some prefer to call this an effort to restore order, or to balance the equation. I accept that seeing a guilty person punished can afford an iota of relief to families of victims, but I’m sceptical as to whether the shark’s execution brings any comfort to the victim’s family. I fail to see how the removal of one shark from the ocean, arbitrarily caught I might add, is going to make the ocean safe once more. There are other sharks, and as long as we venture into the ocean, there will be other incidents. You can call it revenge, punishment or whatever, but I suspect it’s nothing more than a vain attempt to control what is beyond our control. We like the see this planet as ours and ours alone. Be it land or sea, we see ourselves as landlords, and any squatters in our domain who dare affront us must be dealt with. For those of that view, you can take comfort. For every 10 of us lost to sharks, we claim around 30 million of them. So rest assured, they are already being punished. Jordan Rivkin is a freelance writer, psychology student and animal-welfare advocate. After nearly two decades in the stock market, he left to complete his 4th year honours in psychology. His main interests are social justice and mental health issues, and he teaches ethics to primary school children in his spare time.